Photo is a screenshot of Rabbi Bowman’s video demonstrating the magnitude of fires in Southern Israel. This video was posted just over a week ago. Starting in March, headlines on Israeli websites have been about the fires in Southern Israel. These aren’t just any fires. They are fires created by Israel’s enemies and directed into the south of Israel for a specific purpose: to destroy property, endanger lives and wreck havoc. Hamas-inspired Gazans, during these few short months, have launched thousands of kites and helium balloons laden with explosives, molotov cocktails and other incendiary material over the border into Israel. On Wednesday, August 1 at 10 am, the Birmingham community will have the opportunity to hear a firsthand account of what it is like to live through this terror. Rabbi Shmuel Bowman, Executive Director of Operation Lifeshield, will be sharing his experience with the fires and how it affected his organization and efforts to protect all Israeli citizens. This special briefing, a joint initiative of the BJF and Levite Jewish Community Center, will be held in the LJCC’s board room. The timing of Rabbi Bowman’s visit is especially important because, despite the fires being an ongoing problem, there hasn’t been much coverage on the fires during July. A quick Google search shows the top few hits are dated May and June of this year. But, if you do a little digging, you’ll find that the fires have not gone away. 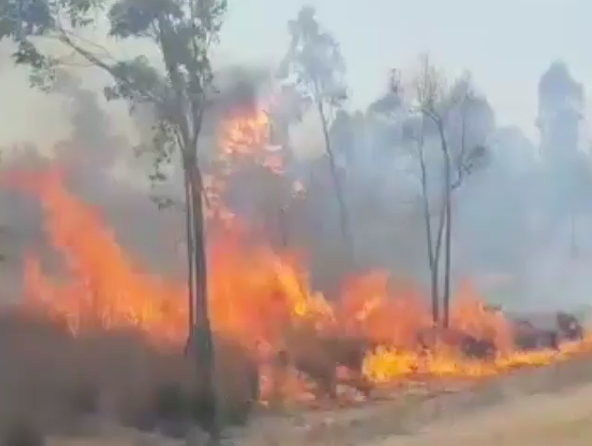 Israel’s enemies are constantly finding new ways to create fires (birds are the recent means through which the fires are started) and the ashes — literally and figuratively — left behind by the fires are something Israel has to face every day. A recent USA Today article interviews an Israeli farmer about how the fires have affected him and his livelihood. With over 8,000 acres of land burned, it’s no surprise that this farmer is overwhelmed with how the recovery process will go. According to USA Today, ecologists are saying this is an ecological disaster from which it could take years to recover. While Google may not recognize that the fires are still a very real problem for Israel, it is comforting to know that other news sources are acknowledging what a burden this damage will be for Israelis during the years to come. Rabbi Bowman will explain just how extensive the damage is and what is being done to respond. During his visit, Rabbi Bowman will also be providing us with an update on all that Operation Lifeshield, which provides Israelis with shelter from rocket fire, has been doing over the past year. For years, the BJF and many local donors have supported Operation Lifeshield and the important work the organization does. The program is free and open to the public. Rabbi Bowman is a great friend of the Birmingham community and the Birmingham Jewish Federation. If you would like to attend this briefing, please RSVP to BJF staffer Florina Newcomb at florinan@bjf.org. If you’ve been anguishing over the struggle that Israel has been facing on its Gaza border, coupled with the vast amount of unfair news coverage depicting Israel’s response unfairly, then please come to this special BJF-LJCC briefing to show your support and to learn more so that you can educate others. Click for the article from USA Today. Click to watch the video Rabbi Bowman posted of the fires.